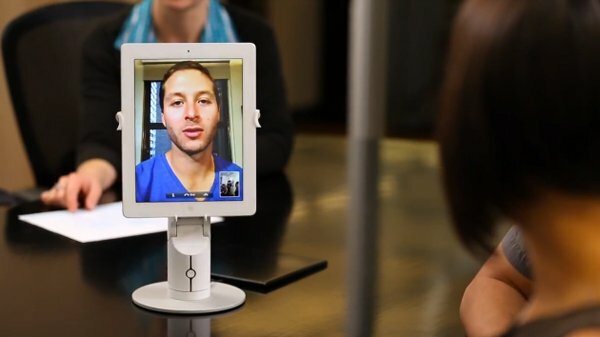 SAN FRANCISCO – Jan. 10, 2013 – Revolve Robotics, an emerging leader in mobile-controlled personal robotics, today announced that Kubi, their easy-to-use robotic tablet platform for video collaboration and telepresence applications, is now interoperable with leading enterprise video conferencing solutions. Kubi enhances existing conferencing tools by giving remote users control of the tablet through swivel, pan and tilt actions, enabling them to “look around” and interact with remote environment as if they were actually in the room. Since its initial unveiling, Kubi has received significant interest from Small-to-Medium-sized Businesses (SMBs) looking to enhance their video collaboration. Kubi now supports video collaboration with Connexus, a CSP-licensed provider of video collaboration via the cloud, Spranto, a company developing free standards-based HD video conferencing, Facetime, Skype, Google Hangouts, Cisco Jabber, Polycom RealPresence, Avaya Scopia Mobile, VidyoMobile, and GoToMeeting. In addition to interoperability testing, Revolve Robotics and Connexus are partnering to co-promote telepresence and mobility solutions for companies. Connexus is a Total Video Conferencing solution provider that enables customers to run enterprise-grade video conferencing, such as Vidyo, for point-to-point and multi-point conferences at affordable prices. The usage of video conferencing and remote dial-ins continues to grow with the influx of the BYOD (Bring Your Own Device) phenomenon among businesses utilizing company-installed IT applications. By using Kubi with Connexus’ service, customers can experience enterprise-grade robotic telepresence using their own tablets without the high cost of setting up dedicated back-end servers. Founded in 2012, Revolve Robotics combines the convenience of mobility with an affordable price point. Revolve Robotics is currently taking orders for Kubi with shipment slated for Spring 2013. Kubi is currently priced at $249, but Revolve Robotics is offering early bird pricing of $199 via its pledge page, which can be found here – http://www.indiegogo.com/kubi. Connexus has been providing VideoConference Services for over 23 years and is an authorized and licensed Customer Service Provider (CSP) of the communications technology offered by Vidyo, Inc.